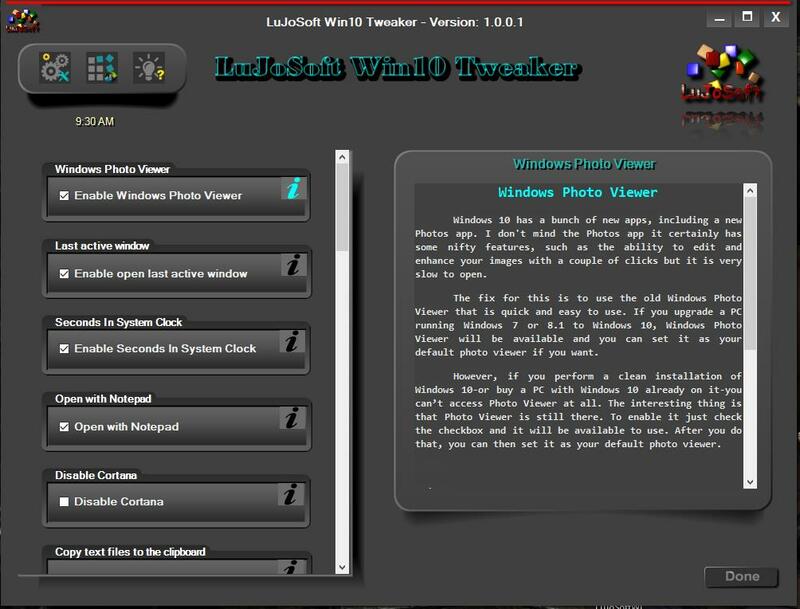 LuJoSoft Win10 Tweaker is a free Windows customization tool that gives you access to useful system tweaks, not just ones purely designed for aesthetics. Is a program that in most case will tweak the registry to change the appearance, the speed or show hidden tools in windows 10. LuJoSoft Win10 Tweaker has some really good options, such as the ability to add useful shortcuts to right-click menus, tweak hidden parts of Windows and fine-tune your system for better performance. Overall, as a free system enhancement tool, LuJoSoft Win10 Tweaker is still in development and will come with more new feature, design and appearance in the next few week, so just keep the check for update on. Remove 260 characters limit in filename. Read the note on the opening screen. Check the checkbox of the tweak you want. To undo untick the checkbox. Please test and report any finding, bugs and also any suggestion you might have. • Added about 15 new tweak.